Keeps Menus Clean and Dry! 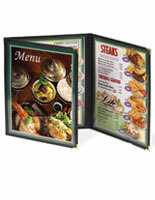 This menu cover helps to display useful information in a highly presentable fashion! Most restaurants spend a lot of money on printing, only to have the menus ruined over time when not protected. 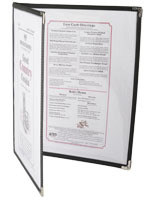 This menu cover helps to keep menus looking fresh and free from stains and dirt. Guests appreciate a listing that is easy to read and not torn or wrinkled. 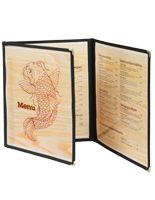 This plastic protector, menu cover comes in a sleek, satin black finish with brass corners for durability. The metal embellishments also help to minimize the possibility of the corners becoming frayed or bent. 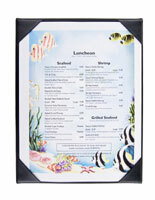 This menu cover is often seen in family restaurants, bars, hotels, diners, and other related dining facilities. The modern design will add style to any food and beverage atmosphere! 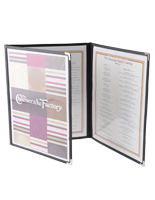 We offer this bi-fold menu cover with clear PVC plastic panels for a higher contrast with better photo and graphic readability. The durable construction also makes it easier for patrons to hold onto while browsing through all of the choices. 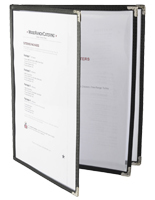 This quality menu cover, such as bistro menus, or sleeve protectors has hemmed bindings that are double stitched using a black-bonded nylon thread. The diner overlay allows you to quickly change 8-1/2" x 11" printouts, so you can customize and edit menus whenever necessary. 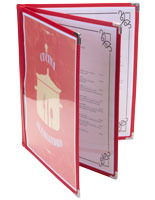 The sleeve protector is the menu cover used in all kinds of eateries! 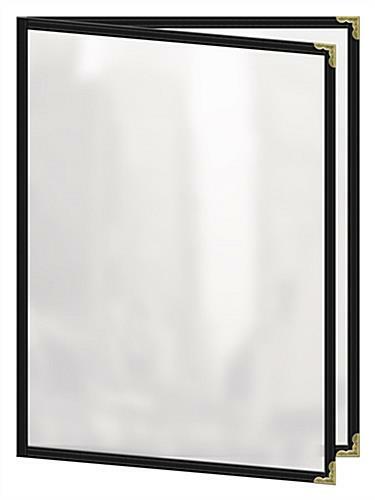 Be sure to check out the other restaurant accessories offered here to see protectors in other sizes and styles. 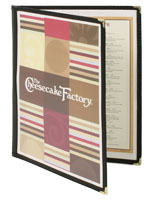 Add an upscale element to your restaurant with this menu cover!